Flash Flood Threat Rises—Are Homeowners Ready for the Downpour? August 5, 1999 – With another three inches of rain drenching the northern metro area yesterday and more wet weather in the forecast, homeowners need to do more than cross their fingers and carry an umbrella. Several areas are under a flood watch or flood warning today because of all the rain that has fallen this week. Colorado floods can cause significant damage, and not having flood insurance may prove costly to homeowners in the next flood's path. Many homeowners erroneously believe their homeowners insurance policy covers flood damage. It doesn't, and up to 75 percent of the buildings in the U.S. located in areas with a high risk of flooding are not covered by flood insurance. Flood insurance is available to both homeowners and renter whose communities participate in the federal government's National Flood Insurance Program (NFIP). Flood insurance can be purchased through any licensed property/casualty insurance professional who is writing flood insurance under arrangements with the Federal Insurance Administration. A 30-day waiting period is required between the time you purchase flood insurance and the time it goes into effect. In addition to making sure you're adequately insured, it's important to know what to do in case of flood. Rocky Mountain Insurance Information Association offers the following safety tips. Keep apprised of weather conditions both where you are and upstream. Distant rain or snowmelt can cause a rampaging torrent headed in your direction in minutes. Remember: Your homeowners insurance policy does not cover flood damage. If you decide to buy a flood insurance policy, which is the only type of policy that covers flood damage, consider insuring your home for 100 percent of replacement cost and buying insurance to cover the contents of your home, as well as the dwelling. Do not try to drive over a flooded road. If the vehicle stalls, you and the vehicle may be swept away. Abandon a stalled vehicle immediately. 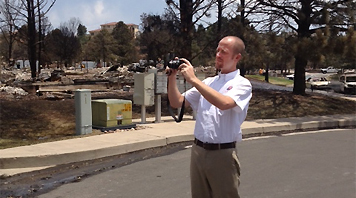 Stay away from disaster areas so your presence doesn't impede rescue efforts and other emergency operations. Drink only boiled water, and discard any fresh food that may have been contaminated by floodwaters. Although homeowners may not be able to prevent a flood, they can minimize a flood's devastating effects by being prepared. Adequate insurance will make your recovery that much easier.